In stock -This product will ship today if ordered within the next 39 minutes. 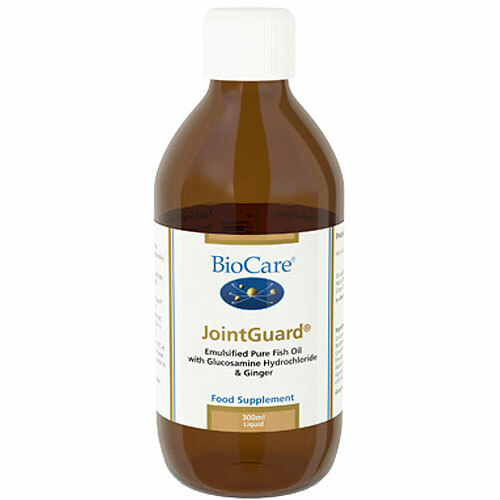 JointGuard combines pure fish oil with glucosamine hydrochloride. The parent fatty acid in the Omega 3 family of polyunsaturates is Alpha-Linolenic Acid which can be converted in the body to longer chain members such as Eicosapentaenoic Acid (EPA) and Docosahexaenoic Acid (DHA). Omega-3 fatty acids may help to maintain a healthy heart, lungs, intestinal tract and the skin. The main dietary sources of Omega 3 Fatty Acids are oily fish such as mackerel and herring which are little consumed by Western populations. Glucosamine is a key component in synovial and bursal fluid, loose connective tissues, tendons and ligaments and may help maintain normal joint mobility. Omega-3 fatty acids may support joint mobility. Glucosamine is a key component in synovial and bursal fluid, loose connective tissues, tendons and ligaments, and may help support joint mobility. Glucosamine Hydrochloride is the preferred alternative to the sulphate form and delivers a higher concentration of glucosamine. In a base of: Orange, Mango, Banana, Vanilla and Pineapple. Concentrated Pineapple Juice, Fish Oil Concentrat*1, Fructose, Modified Corn Starch, Water, Glucosamine Hydrochloride,, Concentrated Orange Juice, Mango Puree, Ascorbic Acid, Pineapple Flavour, Banana Puree, Acacia Gum, Antioxidant (Natural Mixed Tocopherols**),, Vanilla Flavour, Sunflower Oil, Alginate, Preservative (Potassium Sorbate), Ginger Oil (Zingiber officinalis), Citric Acid. One tablespoon (approx 15mls) taken daily with food or as professionally directed. Not suitable for individuals allergic to fish by-products, soy or citrus. Caution is advised in diabetes. Below are reviews of BioCare JointGuard - Pure Fish Oil - 300ml by bodykind customers. If you have tried this product we'd love to hear what you think so please leave a review. 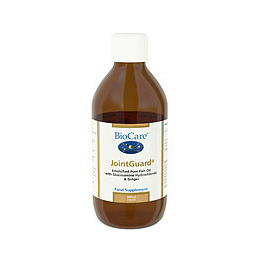 JointGuard combines pure fish oil with glucosamine hydrochloride. Omega 3 fatty acids like fish oil help maintain a healthy heart and may help maintain joint mobility. Glucosamine may help maintain normal joint mobility.